Ps(alm). Why (have the nations raged)? 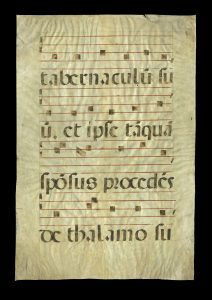 The first psalm was sung at the Introit early in the mass at midnight on December 25 celebrating the Nativity of Christ. The second was sung as the Sequence later in the mass. The oblong diamond indicates that a letter (usually an “M” or “N”) is missing in the text. 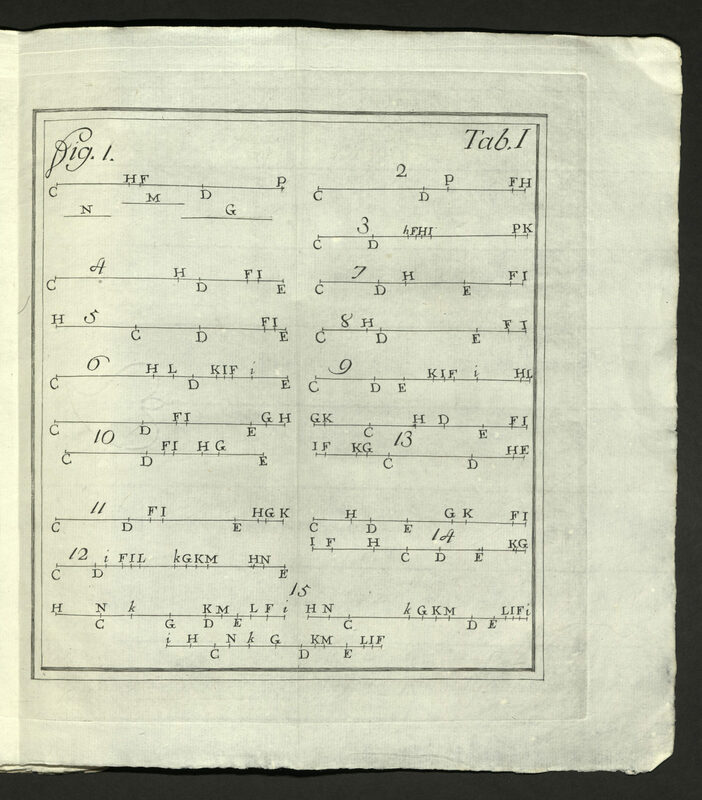 The musical notation contains a “do” clef at the beginning of each line and a custos or “guard” at the end of each line. MS chant frag. 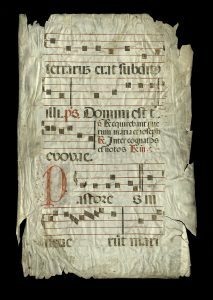 2 — Parchment leaf from an Antiphonal, 16thc. 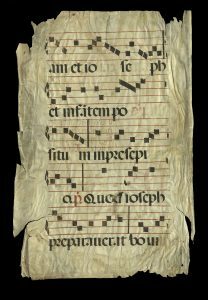 Spain, the Proper of Time, Feast of the Vigil of the Octave of Christmas (1 Jan), Matins, First Nocturn. 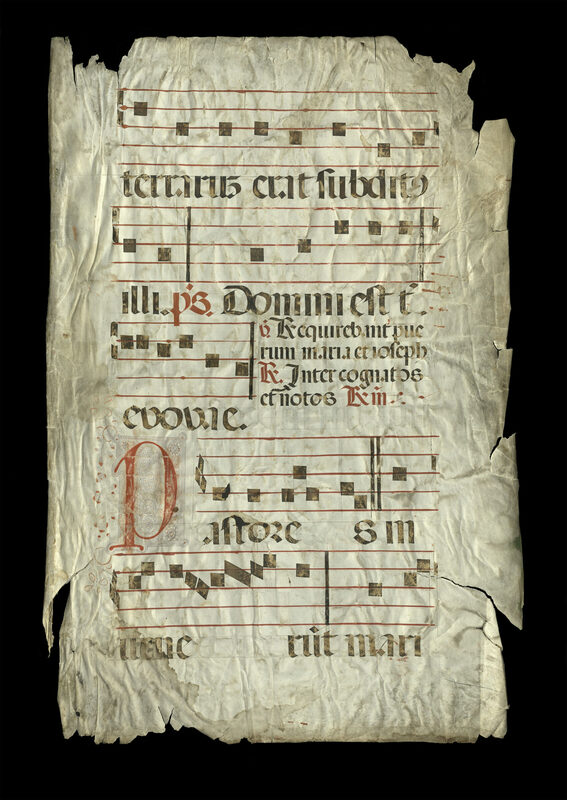 These hymns would have been sung at the mass and Divine Office celebrating the Nativity of Christ. 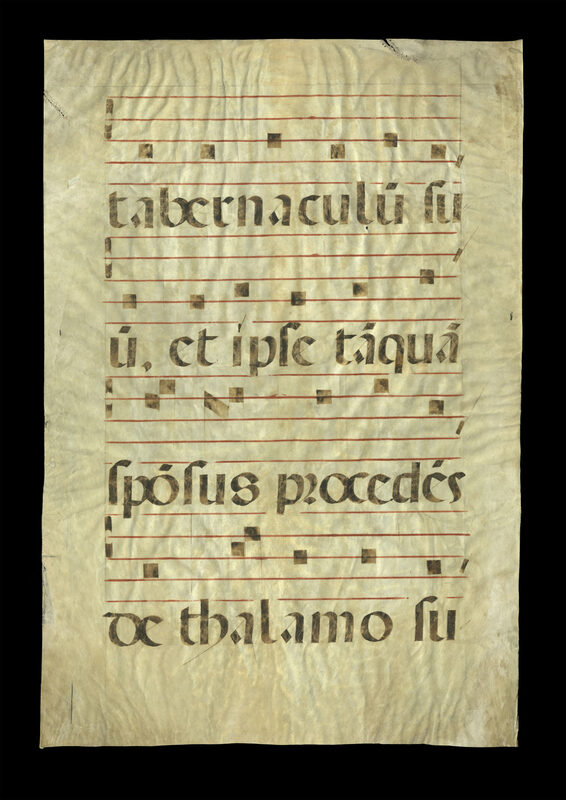 The psalm “Domini est terra” was sung at the Introit of the mass on Christmas Eve, and the “Pastores invenerung” (Luke 2, 16) was sung as the Sequence. The latter was also sung on the Feast of Saint Joseph and the Antiphon sung at matins early in the morning. 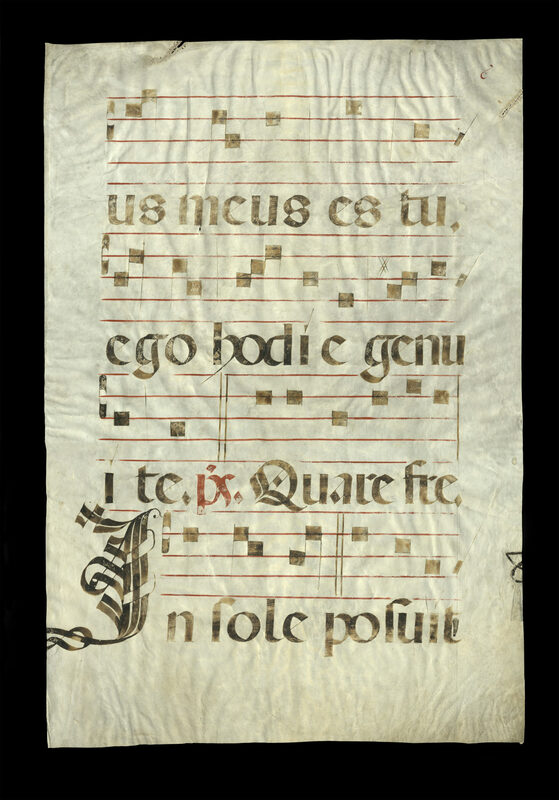 The sequence of meaningless letters “Euouae” after the psalm is an abbreviation for the first letters of a common ending, a type of cadence in medieval music. 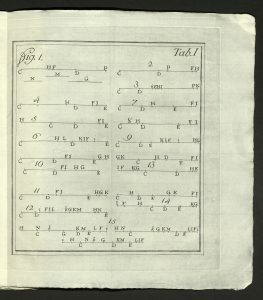 Thus musical notation indicated both a “do” clef at the beginning of the recto and “fa” clef for the remaining hymns with a custos at the end of each line. 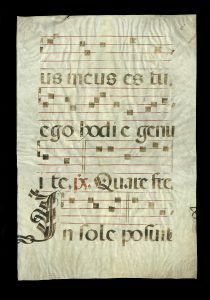 A textual variant is the verse from Luke (2, 44) which omits the participle “festinantes” signifying “in a hurry” which is present in all versions of the Vulgate. MS chant frag. 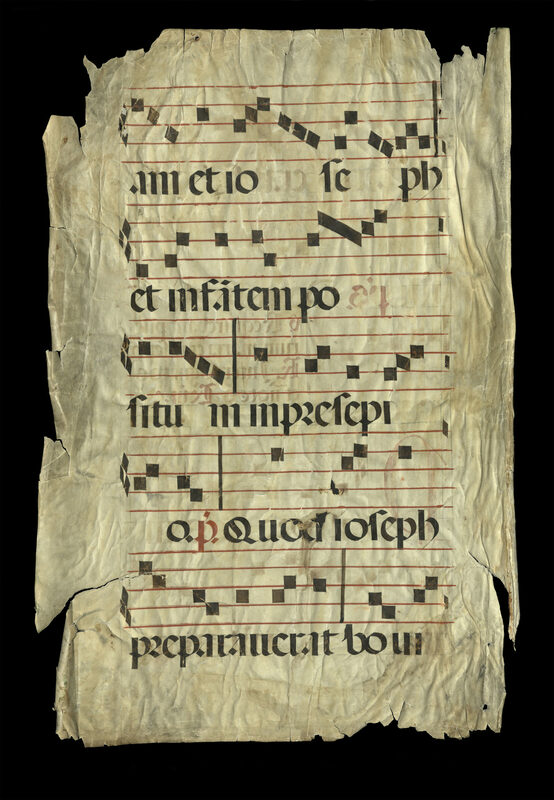 3 — Parchment leaf from an Antiphonal, 16c. Spain. 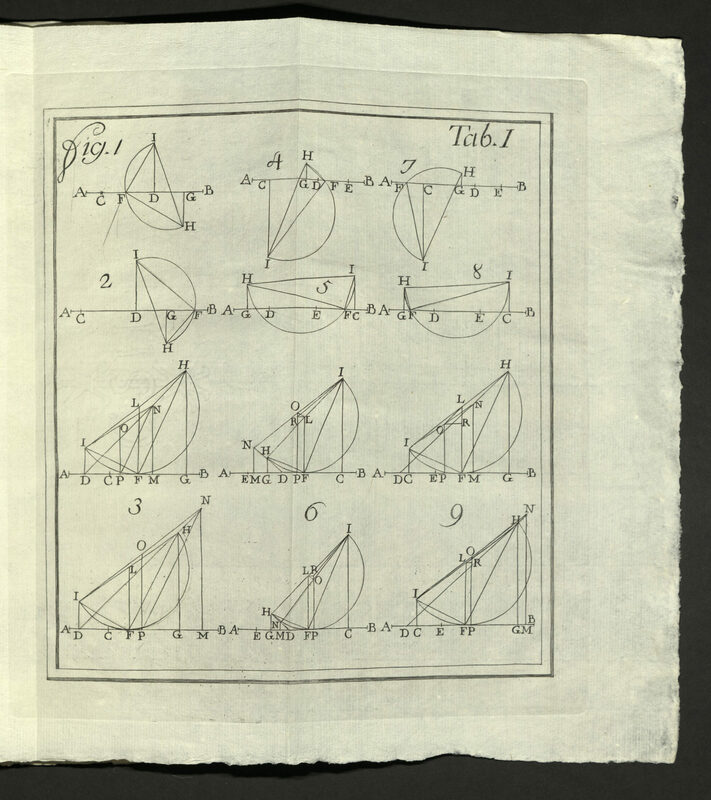 This scarce mathematical work on hydraulics and geometry was printed by Giambattista Bodoni. Bodoni was born in Saluzzo, Piedmont, Italy in 1740. He died in Parma, Italy in 1813. An engraver, type designer, printer and publisher, Bodoni was invited by the Duke of Parma to set up and run a printshop. 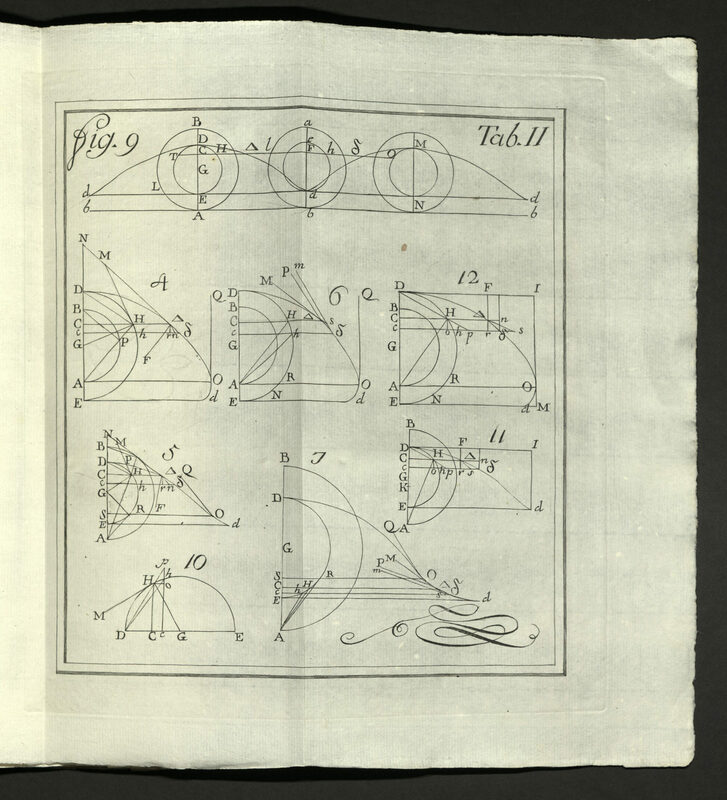 In 1779, Bodoni opened his own type foundry. In 1782 Charles II of Spain named Bodoni his court typographer. Bodoni is still recognized for his roman, Greek, Gothic, Asian and Russian fonts, and lines, borders, symbols, numbers and musical notation. 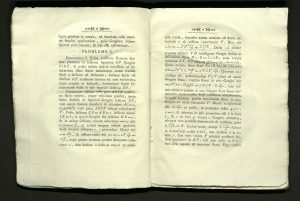 He was the most prolific punchcutter in the history of printing: an inventory of his shop, compiled by his widow, revealed 25,491 punches and 50,283 matrices, each cut by hand. 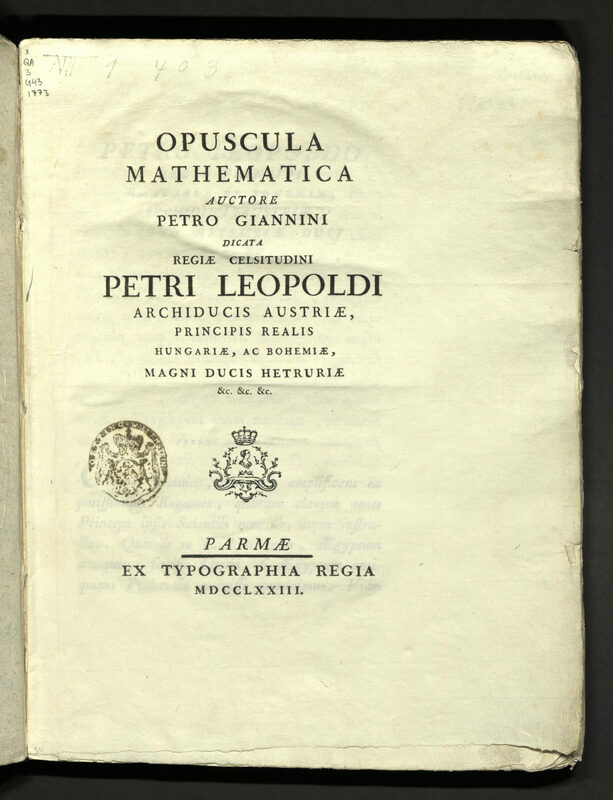 He was friend to kings, ministers and others in power, dubbed by them as “Re dei tipografi, tipografo dei re” (king of typographers, typographer of kings). He basked in popularity, receiving numerous high honors. 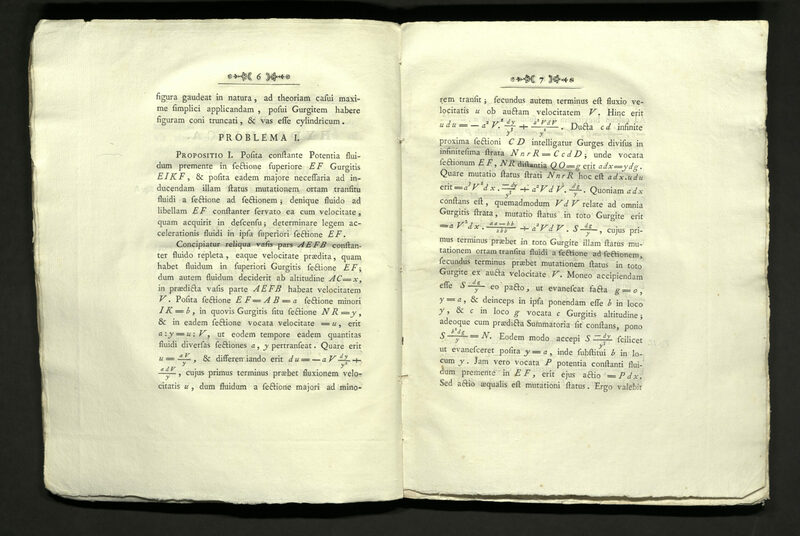 This plain edition, with simple yet gracious chapter-heading ornamental devices, is a great example of the beginnings of Bodoni’s signature style: wide margins; clear, solid type; and exquisitely designed and printed mathematical figures all point to Bodoni’s typographical genius. Oh, yeah. And then there’s the math. 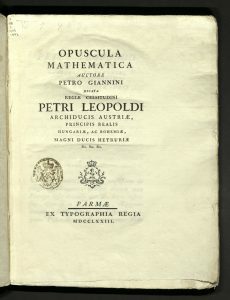 Pietro Giannini was a student of Vincenzo Riccati (1707-1775) who urged Giannini to publish Opuscula Mathematica (1773). Opuscula is divided into three parts. In the first part, Giannini studied water falling through a hole. 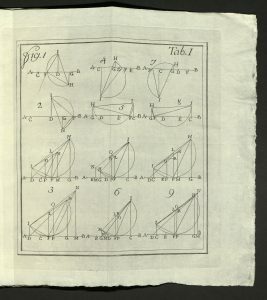 Isaac Newton had addressed this in his Principia, but Giannini’s work is less experimental, more mathematical. Giannini was appointed a professor of mathematics in Seville, Spain. 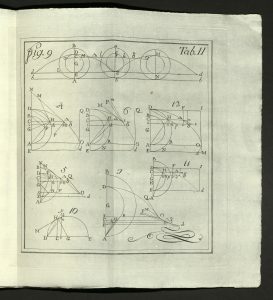 This edition contains ten engraved folding copper-engraved plates, each with multiple diagrams. It is illustrated with a woodcut device on title-page. Our copy is bound in original wrappers with an old manuscript spine label.